Charles Minard's Flow Map of Napoleon's Invasion. Public domain. This map, drawn by French engineer Charles Joseph Minard, shows Napoleon’s disastrous invasion of Russia in 1812, three years before the Battle of Waterloo. The orange and black columns crossing the map show the French Grande Armée on its march to and from Moscow. The width of the column shows the size of the army – ever-shrinking as thousands of Napoleon’s soldiers died of disease, cold, starvation and Russian attacks. This image brilliantly displays the devastation of Napoleon’s army over the winter of 1812-13. It has been called “the best statistical graph ever drawn”. Napoleon invaded Russia in June 1812, marching his army of 680,000 soldiers across the river Neman. He hoped to force Tsar Alexander I of Russia to stop trading with Britain, and finally force the British to end their long wars against France. Instead, the Russian army retreated, refusing to give Napoleon the decisive battle he fought. The French forces marched on Moscow, but Cossack troops burned the countryside ahead of them, cutting off all sources of food and shelter. The campaign was a disaster, with 380,000 troops of the Grand Armee being killed. With his largest army shattered, Napoleon was forced to retreat across Europe, eventually being defeated by the Allied Sixth Coalition, and sent into exile on the island of Elba. The black line straggling back from Moscow shows this terrible rate of casualties, and the temperature scale at the bottom of the image charts the freezing weather conditions of the Russian winter. 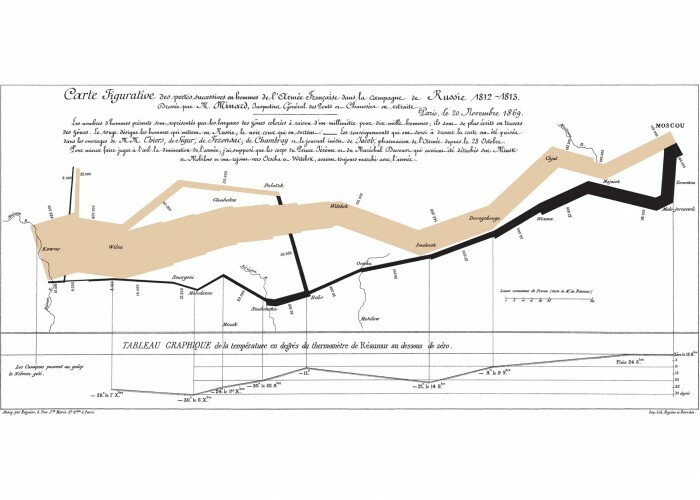 In all, this image displays six types of data in two dimensions: the number of Napoleon’s troops; the distance travelled; temperature; latitude and longitude; direction of travel; and location relative to specific dates. The arrows coming off the main bar also let Minard show where smaller forces left the main army and later rejoined it. This chart, seen as his finest achievement, was created in 1869, when Minard was over 80 years old.